John Cornelius Halsema was born August 1, l876 in New Bremen, Ohio. He was the son of Johannes and Veronica (Dutmer) Halsema. He was prominently identified with educational activities for nearly half a century. Upon completing his basic education he began nurturing his ambition of becoming a school teacher. He launched his teaching career by teaching in the small country schools surrounding his hometown, New Bremen, Ohio. He advanced his education each year through summer studies at Miami of Ohio University, receiving his B.Sc. degree in 1911. In l915 he completed his study at Ohio State University where he received his M.A. degree. After 5 years as Principal at New Bremen H.S. he accepted the Superintendency of Schools at Minster, Ohio, a neighboring town, and continued in that capacity until l941. On June 21, 1922, he married Constance Durbin who had come to Minster, Ohio from Danville, Ohio two years before as a teacher in the High School. During his 48 years of service and dedication in his chosen field, he was also active in civic and other significant activities in the community. He was one of the founders of the Minster State Bank and served as a Director for 26 years. 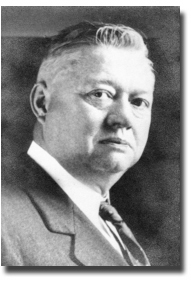 He also served as a Director of the First National Bank of New Bremen. He was a participant in Teacher activities of National, State and County Associations. Due to his foresight, and recognizing the need, he established classes for "challenged" students in the mid 1930's an innovation in its infancy in the school systems. His untimely death on April 4, l941 at the age of 64, was due to a heart attack. Constance Durbin Halsema died in Columbus, Ohio February 5, 1997. They were the parents of four daughters, Mary Veronica Bresnen, Rita Constance (Sister Corinne OSF), Margaret Cecelia Troyan and Juliana Theresa Devine.